When Zel's father is killed and her sister is taken, Zel ends up in a safe house for mutant teens that officially shouldn't exist. While she plots ways to rescue her sister, Zel finds herself falling for the resident mysterious loner dude, Cy, and discovering long hidden family secrets. There's so much to love in this novel that I struggled to pick the appropriate Zombie Chicken Merit Badge. 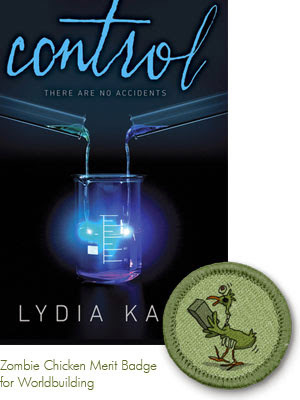 Should I go for the romance badge to recognize the sizzling chemistry between Zel and Cy? Should I choose the twists badge to give props to a plot that continually surprised me with it's major reveals? Both could definitely be argued for, but in the end I went with worldbuilding because CONTROL totally immersed me in the futuristic world of 2150 - from the automatic cars to the crazy nightclubs and all the features of the tricked-out safe house. CONTROL comes out next Tuesday. Find out more about it at the author's website. I really loved this too. Thought the pacing was fantastic as well as the world building.